So the tricky part !!! After you have deployed BranchCache in your network, how can you measure or confirm that it is working , and how can you troubleshoot BranchCache issues after deployment? There are amazing performance counters in Windows 7 client that can tell you exactly how your BranchCache deployment is behaving. Just go to your Start icon, type (PerfMon) , and the Performance Monitor snap in will open, click on (Performance Monitor) icon, then right click any empty area in the middle pane, and chose (Add Counters). Now scroll to BranchCache, and choose all the sub counters and then click Add and OK.
Then change the Graph Type to Reports as shown in the below figure. 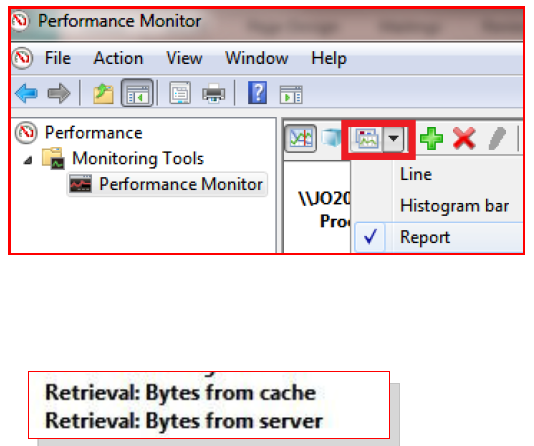 Bytes from cache indicates the amount of data that the client retrieve from a neighbor peer of from the Hosted Cache server. Bytes from server, is an indication of data moving across the WAN. Another effective way to configure and monitor your BranchCache activity and behavior is by using the netsh BranchCache command. Open a command window, and type (netsh branchcache show localcache). This will show you a summary of the BranchCache settings on that client. You can also flush the BranchCache content cache on your client Windows 7 machine by typing ( netsh branchcache flush). You need an elevated command window to do this. As you can see form the output, the first line is showing that the client is configured with BranchCache in Distributed Cache mode. The second line shows that this machine (which happened to be a laptop), will not serve clients from its cache if it is running on battery power, so that your laptop will not run out of power while processing BranchCache requests from neighbor peers. The last line shows that the BranchCache service is running which does not necessary indicates that the client is configured with BranchCache. Only the first line from the output indicates that this client is configured with BranchCache. If you are interested to know more about this nice technology, come here again and filter posts with (BranchCache) tag.